The LGBTQ community is seeing an exponential surge in affirmative visibility. Favorable political rulings and a growing sum of “out” celebrities contribute in LGBTQ individuals proudly self-identifying and expecting brands to embrace them just as much. Marketers should prioritize inclusivity, take note of the growing spending power, integrate appropriate messaging and—with the help of Motivate’s population projection dataset—segment the community’s most thriving neighborhoods and nearby retailers, in addition to the media consumed. 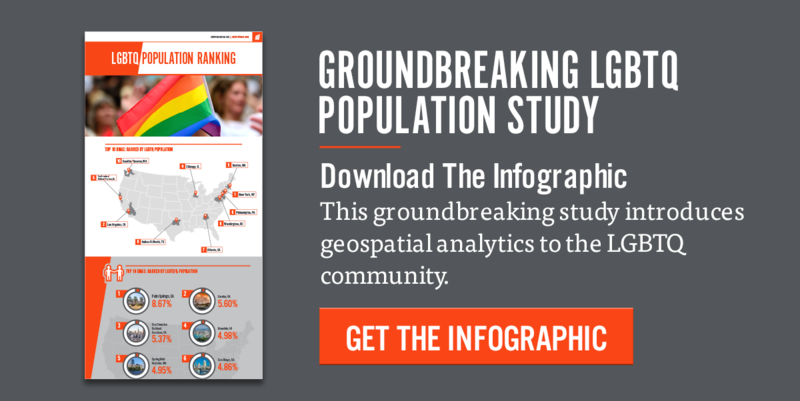 Knowing the location and population projections of LGBTQ consumers from a macro-to-micro level, Motivate can hyper-target messaging near a retailer’s location, customizing strategy and driving results at a local level. Motivate’s analytics and data visualization team developed an interactive dashboard displaying zip codes with the highest concentration of LGBTQ households in relation to one of the largest specialty retailers in the U.S., Forever 21. The fast fashion retailer caters to men and women with more than 600 stores in operation. Motivate is the leading specialized insights and media partner for reaching the LGBTQ community through authentic, relevant and targeted media. You need a trusted media partner that understands the impact of changing demographics and helps you navigate the marketing maze. We understand the nuances and intricacies of the LGBTQ market and have the resources and expertise to ensure maximum buying power, impact and ROI.